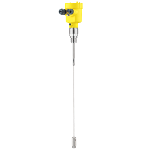 The VEGAFLEX 86 level sensor measures all liquids under extreme pressure and temperature conditions. Even in applications with buildup, condensation and foam generation, the sensor gives reliable and precise measured values. In saturated steam applications, a special reference probe ensures a density-independent measurement. The VEGAFLEX 86 gives a cost-effective level and interface measurement for your given application. The VEGAFLEX 86 is a robust guided radar sensor which measures the level and interface of liquids at high process temperatures and pressures in tanks of all types. 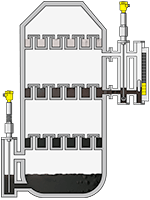 The VEGAFLEX 86 operates independently of media properties such as density or dielectric constant in widely different vessels, bypasses or boilers.